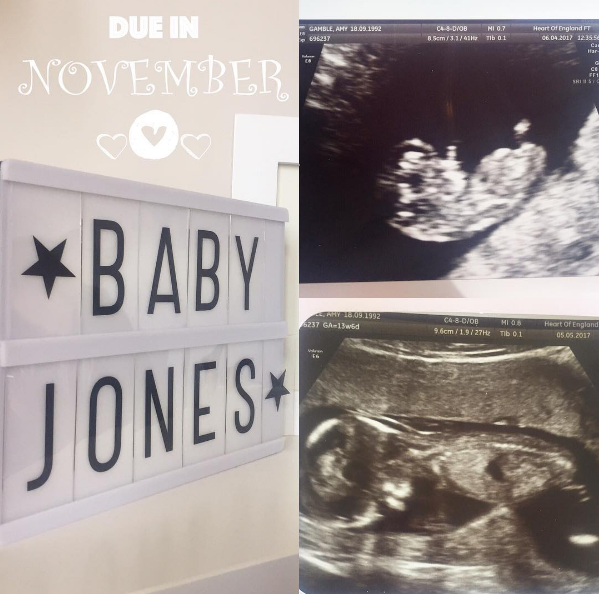 If you follow me on instagram, twitter or facebook you may have spotted our announcement yesterday WE ARE HAVING A BABY! We are 14 weeks and 2 days today and it's been so long! I am going to do a first trimester update and I will go through all of my symptoms and how i've found the first 14 weeks. Today I thought i'd just share our announcement and I also have tickets to the baby show to give away so you can read how to win those below!! We have been trying for a baby so are really excited and happy about our news! I stopped taking the contraceptive pill back in September and just kind of decided to stop preventing pregnancy rather than actually trying to get pregnant, I was using the Ovia fertility app on my phone but this was more to track my cycle. In February I was late on my period (i'm never late) and I felt different, I was going to the toilet more so we picked up a few pregnancy tests. We did two pregnancy tests on the week that I was late and they were both negative so I thought it may just be down to stress that I hadn't started my period yet. About a week later I still felt a bit weird and said to Clint that I wanted to do another test and it had the faintest positive reading. So i did another test and this also had a really faint positive so I phoned my mom who was super excited and she basically said even if it's a faint line it still means i'm pregnant, she said she would bring me another test home from the doctors where she works. So Clint and myself just spent the day being excited but nervous as we wasn't sure if we were pregnant or not. We went round to my moms when she finished work and did the other test and this was even fainter than the two we'd done already so I was so scared that I wasn't pregnant, we had been doing the tests that show up a line so decided to go to Tesco and pick up a Clear Blue test that would say 'Pregnant' or 'Not Pregnant' so we took this back to my parents house and waited the 5 long minutes and up popped Pregnant 1-2 weeks! It was crazy and for anyone getting a faint positive result just go and get a clear blue it's a lot less stress haha. As I said i'm going to do some pregnancy updates on my blog and I really want to start doing outfit posts again, i've been abit paranoid incase anyone asked if I was pregnant. I'm already showing and have a nice little bump. Thanks to everyone for all the lovely comments and likes over on instagram, twitter and facebook yesterday, my phone was going mental all day! I'm glad I can talk about it now! The show is a great way to get hands on and try before you buy. Brand and product experts will be on hand to tell you everything you need to know, so it’s a great opportunity to compare products and find the right fit for you. There will be over 200 exhibitors showcasing a huge array of essential baby products from trusted brands as well as the latest innovations. All the major baby retailers will be there, alongside market leading brands such as iCandy, Stokke, UppaBaby, Chicco, Britax, MAM, Nuby, Mothercare and Italian brand Peg Perego! There will also be independent brands that you won’t find on the high street. And once you’ve shopped until you’ve dropped, don’t worry about all the carrying as you can take advantage of the free Emma’s Diary Collect-By-Car service where you can drop off all your purchases and continue until you’ve got a car full! There will be a wonderful line up of speakers on The Baby Show Stage with MadeForMums including experts from the world of breastfeeding, sleep and nutrition! It really is a must-attend show for mums and dads to be, parents, friends and family members. We’ve teamed up with The Baby Show to give away 2 pairs of tickets worth £20 each! No purchase necessary. Entrants must be aged 18 years or over. Competition is open to UK residents only.Entry into this competition confirms your acceptance of these Terms and Conditions and your agreement to be bound by the decisions of The Baby Show.